Yesterday I used the last bag of frozen Swiss chard. Seeing the white bottom of the freezer is like seeing the ground again after the snow has melted – an unmistakable sign that it’s spring. 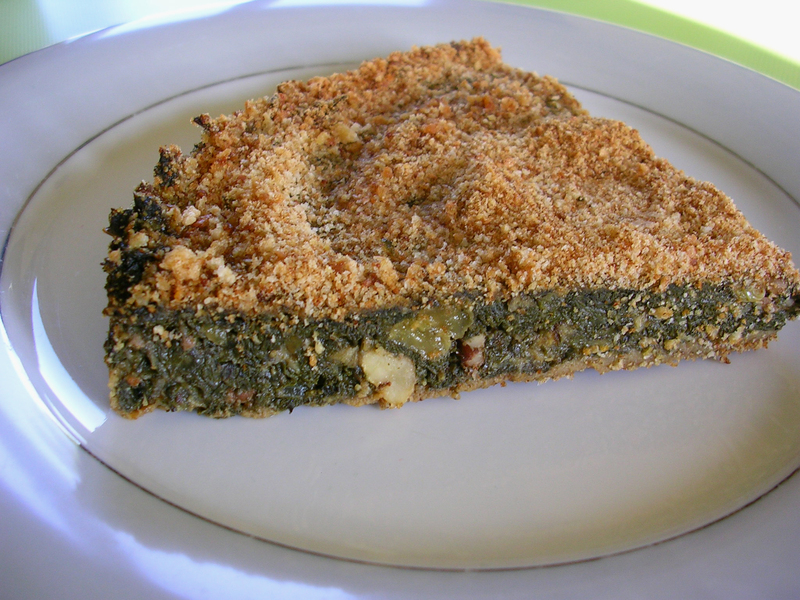 The Swiss chard went into a crustless Italian Swiss chard torte Venetian style, Tegliata di Biete. I based it on Marcella Hazan’s recipe from Essentials of Classic Italian Cooking but took several shortcuts. And, more importantly, I did not use pine nuts. I don’t remember the last time I bought pine nuts that did not taste rancid. Chinese pine nuts are quite awful, and the real stuff, pine nuts from the Mediterranean (Lebanese are viewed as the best), are expensive and hard to find. I sometimes food-fantasize about the delicious fresh pine nuts that were floating in the countless glasses of sweet tea I had when I lived in Tunisia. Back then, though, I did not have a garden where I could grow my own Swiss chard. If I had to choose between the two, I would always go for the garden – even if it means using walnuts instead of pine nuts. 1. Preheat the oven to 350 degrees F. Spray a 10-inch cake pan with oil. 2. Chop the Swiss chard finely. With a bit of water clinging to it (or partially thawed), place it in a large skillet and cook, uncovered, until the chard is fully cooked through and wilted, about 10 minutes, stirring often. Remove to a bowl. 3. Heat the olive oil and cook the onion until golden. Add the chard and cook for another 2 minutes. Remove both to the bowl. 4. Place the raisins in a small heatproof bowl and pour hot water over them to soak. 5. Lightly toast the breadcrumbs in a pan on the stove. Distribute half of them in the prepared cake pan. 6. Lightly toast the walnuts in the pan in which you toasted the breadcrumbs. Cool and chop coarsely. Drain the raisins and squeeze dry in a paper towel. Add walnuts and raisins to the bowl with the Swiss chard. 7. Lightly beat the eggs and add them to the mix together with the parmesan. Add salt and pepper and mix well. Spread the mixture over the breadcrumbs and even it out with a spatula. 8. Spread the remaining bread crumbs evenly on top. Dot with butter (I use a lemon zester to produce tiny strands). Bake in the preheated oven for 30 minutes. Serve hot or warm. Sounds delicious, but I don’t see Parmesan listed in the ingredients. How much Parm did you add? Thanks. LOL. I was anxious to try it! Awesome tip about using the zester to shred the butter. My goodness this sounds good! can’t wait for the chard.